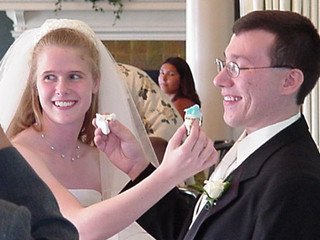 Album Description: On August 11, 2001, Erin and I attended the wedding of Geoff and Kim Belknap out in Olean, NY. While I'm sure they have plenty of pictures on their web site, these are the pictures we took. This group consists of pictures from the beautiful outdoor ceremony. Images: 20. View: Sequential | Slide Show, delayed 15 sec, 30 sec, 45 sec | Thumbnails. Immediately following the ceremony, a reception was held inside the club. Images: 19. View: Sequential | Slide Show, delayed 15 sec, 30 sec, 45 sec | Thumbnails. Unless otherwise noted, all content © 2000 - 2009 Scott Sorrentino.